Keep your wine glass collection stylishly displayed with this beautiful and elegant rotating wine glass rack. Whether you're entertaining or dining alone, this lovely metal wine glass rack keeps your wine glasses conveniently close at hand, thanks to a top section with enough curled horizontal hooks to securely hold up to 6 glasses. The stylish curves and shimmering chrome-tone metal that form this wine glass drying system make it a decorative accent as well as a sensible storage solution. 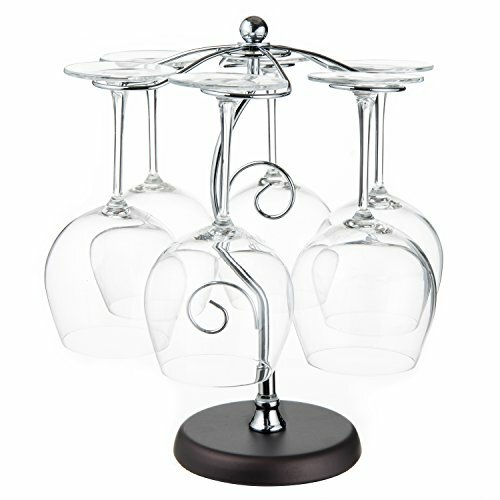 This sturdy 6-glass wine glass rack can be easily moved wherever you need it, whether you're displaying your glasses on your dining table or storing them on your kitchen counter or in a kitchen cabinet, and the sturdy base keeps this wine glass rack - and your wine glasses - stable and safe. Should you need to put it away, this wine glass drying rack can be disassembled easily for convenient storage. Use this wine glass stand to add classy style to your kitchen or dining room or give it as a thoughtful housewarming, wedding, bridal shower, birthday, or Christmas gift.